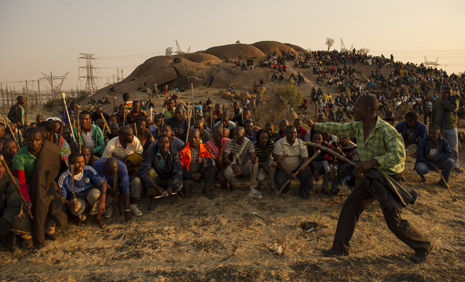 Violent clashes between police and striking miners have left between seven and 18 people dead at the last count. But the miners – specifically, the rock drillers – are determined to stay on their outcrop until they are heard. But it’s more than a strike, writes GREG MARINOVICH – it’s becoming a war. Several thousand men cover the orange outcrop of igneous rock like a single organism, spilling onto the dry thorn-veld below. They are wrapped in blankets; their spears and fighting sticks protruding menacingly as they chant songs of war. Ten men have died around this strange geological redoubt; two of them policemen. 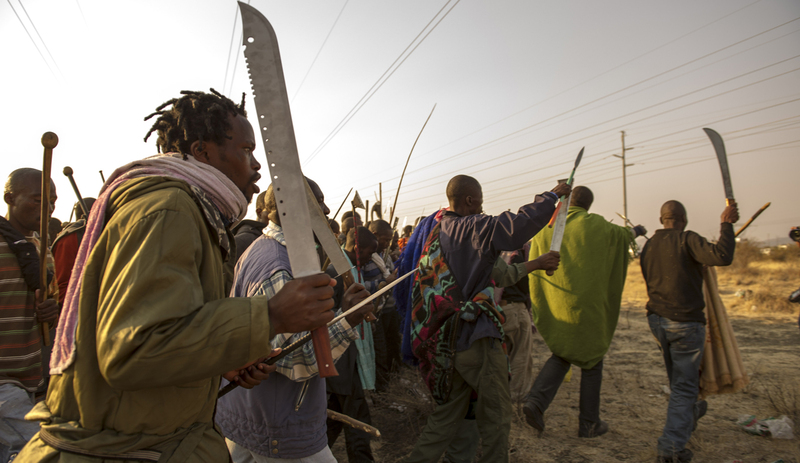 The violent showdown between these miners and their multinational employer, the platinum giant Lonmin, shows no sign of abating. The hill is encircled by riot police in more than a dozen armoured Nyalas that surround the hill called Wonderkop. Further down the rutted road, more than a hundred policemen from the tactical unit and a private security firm eat their supper from plastic containers. They are dressed in bulletproof vests and are armed to the teeth. It looks like war. It is a war. A war of survival, certainly for the miners, and perhaps for the future of Rustenburg’s platinum mines too. A few of the miners carry indecipherable cardboard signs with their demands. A man emerges from the shuffling, chanting body of men, ostensibly asking for a cigarette. Another joins him and we speak about who they are and what they want. All of Lonmin’s mine employees are out here, one claims. People of all nations and all job descriptions are here. All they want is for the lowest paid miners to get a decent wage. The rock drillers at Lonmin earn R4,000 a month, a scarred man tells me, no matter how long they have worked at the mine. They demand R12,500. This is a massive increase of over 300%. Not surprisingly, mine management has balked, in addition to the fact that they are locked into a wage agreement that only expires next year. But surely this is the negotiating territory of the union, National Union of Mineworkers (NUM), part of the massive and powerful Cosatu umbrella, which represents them in a closed shop situation. Lonmin needs a good August to meet its annual production figures in a market where the shine has most definitely gone off platinum. But its share price has dropped precipitously on the back of the strike. Why has it all gone so wrong? Let’s step back here. The strike was called by the rock drillers. These are the men who work right down at the rock face, who have to work with a 25kg drill that vibrates wildly for the duration of an eight-hour shift. When there is a rock fall, it is generally the drillers who are the victims, who lose fingers or lives. It is the most dangerous job in the business. They regard themselves as men amongst men. It is a sub-culture of machismo. Throughout the underground mining industry in South Africa, the rock drillers are BaSotho from Lesotho. It is their badge of pride that they do the dirtiest, most difficult job; yet on just two platinum mines, Lonmin and Impala Platinum (Implats), it is AmaMpondo and the related lBmvana (both sub-groups of the Xhosa) who dominate. It is no coincidence that a bitter seventeen-week strike at Implats was also led by the Mpondo/Xhosa drillers. The striking miners I spoke to said that the Implats drillers had also been earning just R4,000 a month, but now they are at R9,500. A mining insider well acquainted with the platinum sector mused on the situation, on the mindset of the drillers. “Even though I belong to a union, they underrepresent my needs. My concerns are not adequately voiced, and I have no influence. Decisions never seem to benefit me. And so a familiar cycle begins – voices begin to murmur, “If we were not doing this dirty work, would any of the other better paid people in the links of mine labour be able to do theirs? If we stop; it all stops. Hence the strike, and the walkout and the killings and the forceful police reaction that left two of their number dead and another in hospital. 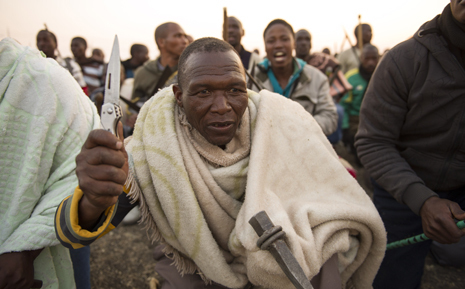 The miners are prepared to suffer violence until management is forced to come and talk to them. They will wait at their altar-like outcrop until they feel that they have found their lost power. So why does the union that represents miners at Lonmin, and before that at Implats, appear not to represent this driller sub-culture? When the 320,000-strong NUM had its election for General Secretary in 2007, the Platinum sector put forward the NUM stalwart Archie Phalane as its nominee. He would run against Frans Baleni. At the congress, just before the vote, Phalane was told he could not contest the election as he was an employee of the union, and the rules stated that he had to be an elected official. His supporters cried foul, and conspiracies abounded, but Baleni ran unopposed. It seems straightforward enough, yet Phalane and his platinum sector supporters were seen to be sympathetic to the cause of ousted president Thabo Mbeki, and Baleni is supportive of current African National Congress leader and President Jacob Zuma. The union was behind Zuma, finish en klaar. There was a resentment of NUM among their platinum sector members for some years, and so when, in May 2010, a NUM vice president, Piet Mathosa, came to persuade his members at Lonmin that management’s offer was a fair one, even though it fell well short of their demands, they did not respond well. A rock was thrown at him, injuring his eye so badly that he lost it, and spent weeks in hospital. That could partly explain why NUM president Senzeni Zokwana, who refused to leave the safety of a police armoured vehicle to address the miners, was shouted down when he tried to persuade the Lonmin strikers to return to work. Which is also why the words of the AMCU official were greeted with cheers in the darkness of early evening in the straggly bush below Wonderkop. Or all of those miners were AMCU members already… No-one was saying – with good reason, as rumours of death threats swirled. That the majority of drillers are either foreign (from Lesotho) or rural, poorly educated men whose elected officials are usually smart young men from the district, whom they are slow to trust, has added to the volatile mix. When we asked NUM what their version of the situation was, a new story emerged. On Thursday morning, Zokwana and Baleni painted an unflattering picture of both the rock drillers and AMCU. The general secretary confirmed that these men were indeed largely the least educated and literate of the employed workforce in the mines. They tend to come from the Eastern Cape and the mountains of Lesotho because the “township boys” don’t want to do the back-breaking work of rock drilling. According to Zokwana, these uneducated rock drillers are always vulnerable to scam artists targeting the platinum industry in Limpopo and North West. He said that in some mines their retirement and death benefits as well as provident fund contributions were targeted. In Lonmin’s operations, these guys have taken the guise of a union that promises them R12,500 – which NUM adamantly says is unachievable for a rock driller. Baleni also said that the AMCU organisers operating at the troubled Marikana mine were all expelled former leaders in NUM. “NUM exercises discipline. It happens all the time that we expel members who form their own union. After a while, it disappears. The unique thing in this situation is the use of violence,” he said. It is indeed a complicated business, with the platinum members of NUM having asserted their independence of their union; it was fertile ground for an upstart like AMCU to exploit this weakness, to make promises that they were unlikely to be able to deliver on. A dangerous ploy – the rock drillers seem to answer to nothing but themselves. The hard men of the underworld are determined to stay on the surface in their struggle to earn a living wage. On Thursday afternoon, when police tried to move the miners off Wonderkop, there were clashes, apparently including shots fired at the police. The tactical unit of the police then retaliated with force which went beyond policing and into the realm of revenge. Journalists say between five and eighteen miners are dead, and many wounded. 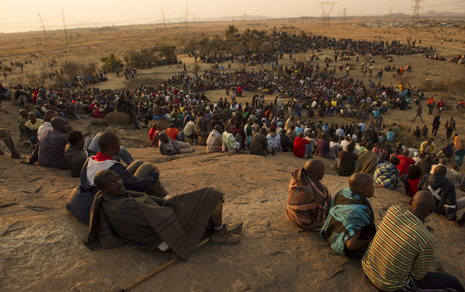 Photos: Lonmin employees gather on a hill called Wonderkop at Marikana, outside Rustenburg in the North West Province of South Africa August 15. The miners are calling for the minimum wage to be lifted from its current R4,000 a month to R12,500. 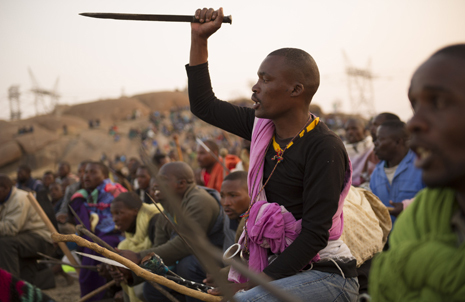 The men are mostly Xhosa and Pondo speaking, and the strike was initiated by the drillers. Photography by Greg Marinovich.